Join Our Metal Heroes Music Academy List! Join Thousands Of Metal Musicians Who Get Free Tips & Know About My Teaching Missions First! MOST METAL & FUN CAMP EVER! Real Quotes From Real Parents! Last summer I was looking for a special camp setting for my musician teenage son. I had researched for weeks so I couldn't believe my luck finding Metal Heroes Music Academy summer camp. 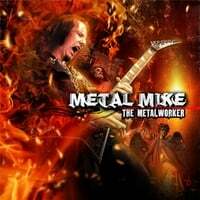 I learned that "Metal" Mike Chlasciak is the real deal, having recorded and toured with Rob Halford, a alumnus of Berklee College of Music and a sponsored artist of Jackson Guitars. Meeting Mike I was assured my son was in good hands. Outside of Mikes "metal" persona is the most down-to-earth, generous and caring camp director you could ask for, his entire crew included. The Metal Heroes camp was exactly what my son could only dream of: an authentic metal music experience. I highly recommend this extraordinary camp, not to be missed! BBQs, CAMP FIRES & CRAFT BEER! Incredible Value! Get 4 Exclusive Advice Blogs & 4 Video Guitar Lessons Per Month. Hang With Players Like Yourself + Get Your Playing Evaluated By Mike For $20 Per Month. WHAT'S NEXT FOR METAL HEROES? READY FOR AN ATTITUDE CHANGE? © 2019 Metal Mike's Metal Heroes Music Academy. All Rights Reserved.